We strive to always accommodate dietary restrictions in our breakfasts without compromising on the quality of what we’re serving. So we spend a lot of time trying out new recipes. King Arthur’s Gluten Free Multi-Purpose Flour is making it easier to adapt regular flour recipes without having to buy several different kinds of flour and mixing them together. So we’re experimenting all the time! 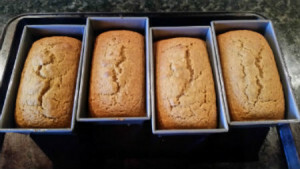 This recipe will make 24 muffins, two 9″ bread loaves or eight mini-loaves. The recipe can be easily cut in half, but it freezes really well so you can store a loaf in the freezer for later. Will keep three days in airtight container. To freeze, wrap bread in freezer paper and store in ziploc freezer bag for up to 3 months. Defrost and serve.